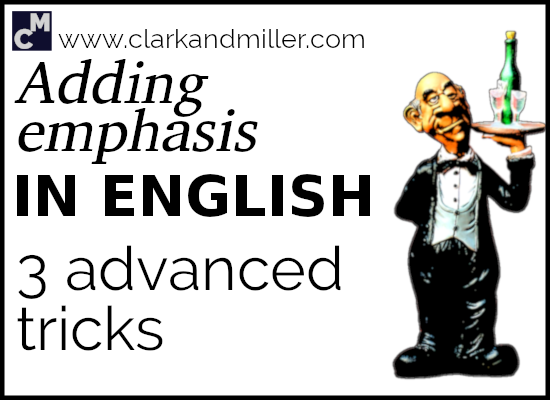 You’re about to learn 3 ways to add emphasis in English. For more advanced English tips, check out 9 Images to Remember These Advanced English Words Forever! Here’s a common situation for high-level English learners. You want to express something important. You know how to express it — but the words aren’t enough. You can’t express how easy something was. Or how boring something is. Or how much you don’t ever ever ever want to touch another frog’s eye again. Ever. So you repeat words (like “ever”) or you use pronunciation to emphasise your point (“he’s soooooo lazy”). But these strategies are getting boring. They also feel a bit childish. The solution here is to change the sentence structure. There are some sentence structures in English that are perfect for making your point stronger. There are two different ways of using this phrase, so let’s look at two different types of people. Remember Alexa from my lesson on positive personality adjectives? Alexa’s a great worker. She’s dynamic, motivated and, perhaps most importantly, when there’s a problem, she knows what to do. How does Alexa solve problems? Alexa solves problems with simple solutions. Imagine you’re with Alexa, and you’re cooking dinner. She’s just hanging out and chatting with you as you prepare the food. It just doesn’t taste right and you don’t know why — you’ve been following the recipe, but it’s just not working. Then as you’re looking at the recipe trying to work out what you did wrong, Alexa tastes the food and makes a simple change to it. You taste it and it’s perfect. Alexa saved the food! “But what did you do, Alexa?” you probably ask at this point. Now Alexa could say “I only added some lemon juice,” but this doesn’t express how simple and beautiful the solution was. It doesn’t express how important that word “only” is in this sentence. We can use this phrase when we want to be like Alexa — solving problems. But solving problems easily. There’s also a more negative way of using this phrase. That’s when we describe someone less like Alexa and more like Andy. Remember Andy? Andy is super lazy. He does nothing all the time. We see Andy sitting in front of his laptop all day, and it annoys us! He’s sooooo lazy! Why doesn’t he do something with his life? One day you’re talking to Alexa. She’s heard about Andy and asks you what he’s like. So how do you describe him? And that’s fine. But it just doesn’t express how lazy he is or how annoying his laziness is. That’s when we change the structure of the sentence to make it stronger. Yeah — Andy’s really lazy. Only then did I understand what was going on. If you’re interested in grammatical terms (and I’m sure you love grammatical terms), this is called a negative adverbial. These phrases are also very useful if you want to emphasise something negative. The trick here is to make sure you use the question form after the adverbial. So one day you go for a wonderful walk by the canal. The sun is shining, and the water looks so fresh and clean. You feel good about life. You start to wonder what the hell is going on. You rub your eyes to make sure you’re not seeing things. But there it is. That … madness. You’re not sure whether you should call the police or run away. Then you notice the camera. And another camera. And an entire film crew. OK — you suddenly understand what’s happening. They’re making a film. It looks like a pretty bad film, but that doesn’t matter anymore — you understand the situation. A great little story to tell friends about later, right? But how do you express it? How do you express that one second you thought you were going mad and then suddenly, after seeing the cameras, you immediately understood. Everything changed. These adverbials often emphasise a sudden or dramatic change (“only then,” “only now,” “never before”) or a complete lack of something (“not once,” “no way”). It was the butler who did it. You know when you want to emphasise a noun in a sentence, so you just emphasise the sound of the word? This is important news, right? Especially for the butler, who might or might not be on his way to the airport about now. But it doesn’t feel dramatic enough. So we change the sentence structure to emphasise that noun. In this case, the subject: the butler. You usually use this structure to emphasise nouns in a sentence. *Technically, this should be “whom,” but very few people use “whom” these days. Just remember to use the right relative pronoun. Notice that in three of the examples I added “not…” at the end. That’s because these phrases are also used to correct someone or to make sure that no one has the wrong idea about something. So there we are — you now know 3 ways to add emphasis in English to make your points even stronger. Can you make the following sentences more powerful? I did all the work — not him! He’d never met such an interesting person until that moment. My cat sleeps all day and nothing else. I just called her and asked her, and it worked. Did you find this useful? Do you know any people (or otters) that might also benefit from this? Then BE AWESOME AND SHARE! Spread the knowledge! 1. It was I who did all the work, not him! 4. All i did was call her and ask her, and it worked. 2. Almost perfect! You don’t need to include “until that moment” because “never before” already carries that meaning. 3. Fantastic! Again — you don’t need to add “nothing else.” Although you can if you like — it’s just a bit unnecessary. Good work Eugene. I’m glad you’ve got these structures in the bag now! Keep up the good work! 1. It was me who did all the work – not him. 2. Never before had I met such an interesting person. 3. All my cat does is sleep all day. 4. All I did is call and ask her. These are absolutely spot on (perfect) Tsvetanka.